123456, password, 12345678, qwerty… or abc123, How many of you have your password one of these??? I think quite a many of you. Even after countless warnings and advices given to the users by many security researchers, people are continuously using a weak strength of password chains. After observing many cyber attacks in 2013, we have seen many incidents where an attacker can predict or brute-force your passwords very easily. 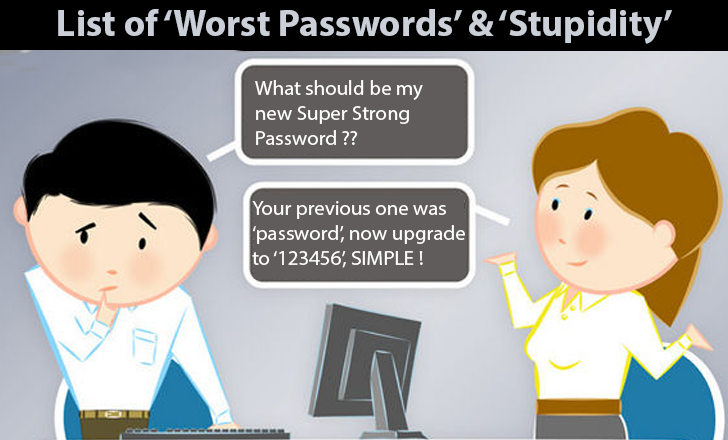 They announced the annual list of 25 most common passwords i.e. Obviously the worst password that found on the Internet. The Most common lists of the passwords this year are "qwerty," "abc123," "111111," and "iloveyou", which are really easily guessable. "Another interesting aspect of this year's list is that most short numerical passwords showed up even though websites are starting to enforce stronger password policies," says Morgan Slain, CEO of SplashData. If you are also using one of these passwords or other dictionary words, then you are advised to change it as soon as possible. We further advise you to use different passwords for different accounts, as if one of your account gets hacked, you’ll be totally ruined. The above list of passwords was compiled from data dumps of stolen passwords posted online, and the firm says it was especially influenced by the millions of Adobe accounts that were compromised in the fall. Stricture Consulting Group attempted to decrypt the leaked Adobe passwords and released an estimate that almost 2 million of the more than 130 million users affected by the breach appeared to be using "123456" as a password. Now when you talk about various security measures to protect your privacy and data, installing an Antivirus doesn’t mean that here your work gets over and you are safe enough. “God helps those who help themselves” likewise nobody can secure your privacy unless and until you yourself not willing to. If it is difficult for you to remember different passwords for different websites and accounts than try using Password manager applications like RoboForm, 1Password, LastPass.